Reviewing books targeted to the young adult market encourages me. Especially when they are filled with themes that revolve around making good decisions. Savvy Smith has been transplanted from the U.S. to London. In addition to trying to find her place in a new peer group, she is also overcoming cultural differences. The May Day Ball is a tradition at this British school. Everyone who is anyone goes to the dance and it seems to Savvy that everyone else has a date. Her list of prospective dates begins to dwindle. When she finally believes she has met someone, she is warned about his propensity to be trouble. Will she bypass her uneasy feelings and compromise? Is this the end of the world? Where does personal identity and self-worth come from? Can we find joy in life when it seems like nothing is working for us? The written word has such a great opportunity to convey messages and this book is no different. 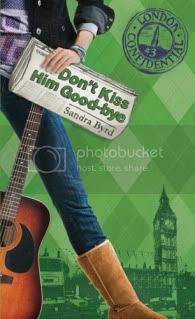 I love Sandra Byrd and her sweet and refreshing humor as well as the details regarding fashion and pop culture. I didn't enjoy this third installment quite as much as the first two because I felt it was lighter on revealing the character's thought process and Savvy's thinking is so encompassed by "boy-craziness", although it is probably more accurate to real-life for many of today's teens. If you have been reading the blog for any length of time, I introducted you to the London Confidential Series a few months ago. If you want to read the reviews of Books 1 & 2 in the series, you can do that here. Best-selling author Sandra Byrd has published nearly three dozen books in the Christian market, including her latest series, French Twist, which includes the Christy finalist Let Them Eat Cake (2007) and its sequel, Bon Appétit (2008). Many of her acclaimed fiction and nonfiction books target the tween and young adult market. She has also published a book for new moms entitled Heartbeats. Several of Sandra's shorter works appear in periodical markets such as Relevant, Clubhouse, Pockets, Decision, and Guideposts. For the past seven years, she has shared her secrets with the many students she mentors through the Christian Writers Guild. Before turning to full-time writing, Sandra was an acquisitions editor in the ABA market. She lives in the Seattle, Washington, area with her husband and two children. This book was provided by Tyndale for review.